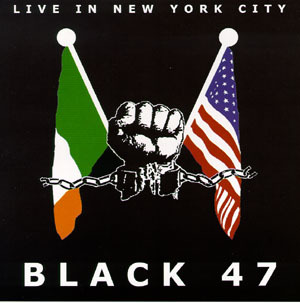 Black 47"Live In New York City"
The New York-based Irish rock group Black 47 burst onto the scene in the late '80s with their energetic and often-political songs and regularly raucous, party-like performances. Fusing Irish roots and content with rock 'n' roll energy and punch, Black 47 quickly garnered a well-deserved national reputation. "Live In New York City" captures the group at its St. Patrick's Day 1998 show at the Wetlands in Manhattan. Featuring many of the group's most requested songs, "Live In NYC" also includes a medley of reels as well as covers of Bob Marley's "Three Little Birds" and Dylan's "Like A Rolling Stone." "In nine sweaty, boozy uproarious, political & controversial years Black 47 has played well over 1500 gigs. Despite shootings, van crashes, blacklisting and an incredibly stupid and shortsighted music industry, we never gave less than 110%. This CD captures one of those nights."